The 563-hp supercar smashed into a house and burst into flames. Believe it or not, the twisted burnt out wreck you see in these horrifying photos used to be a McLaren 570S. Now it’s completely unrecognizable in a scene of utter devastation. Look closely, and you can just about make out small fragments of its original orange paintwork. How did this $185,000 supercar end up in such a sorry state, you may ask? The accident happened in Trowbridge, UK, when the supercar smashed into a house in the early hours of the morning. It was buried beneath a collapsed wall before bursting into flames. Luckily, the BBC reports that both occupants escaped the wreckage before it caught fire with only minor injuries. “Prior to hitting the building it snapped an electric pole in half, and forced the top half of the pole through the window of the house,” said Damien Bence of Dorset and Wiltshire Fire and Rescue. He also said it was “absolutely amazing” that the pair walked away from the wreckage. The crash left a live electrical cable strewn across the highway, forcing crews “to negotiate their way through part of a wood in order to get to the incident." 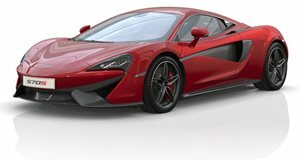 Powered by a twin-turbo V8 engine that produces 563-hp, the McLaren 570S can accelerate from 0-62 mph in just 3.2 seconds.